Beginning in 1931, Japan began a series of excursions into China that eventually broke out into total war with the Marco Polo Bridge Incident in 1937. China’s communist government maintains that the Guomindang (国民党, formerly Romanized as Kuomintang) refused to offer resistance against Japan during this time period. While this is partially true, after 1937 millions of soldiers fought under Guomindang leadership against the Japanese. Many of these soldiers and most of their leadership later fought against the Communist Party in the Chinese Civil War from 1946-1949. This presents a significant problem for public memory in China. Memories are enshrined and maintained by museums and memorials, basically all of which in China are controlled by the government, and therefore the Communist Party. This raises questions over how the Communist Party will depict their former adversary in their more heroic moments of Resistance against Japan. There is however significant adherence at all levels of society to the official history of the Communist Party, which maintains that Jiang Jieshi (蒋介石, formerly Romanized as Chiang Kai-Shek) failed to resist against Japan, and the Communist Party was the “tower of strength” against Japan. However, with greater distance from the central government, Chinese memorials appear to take a much more positive view of the Guomindang. This paper will analyze three sites, The National Museum, the War of Anti-Japanese Resistance Museum at Lugouqiao, and the Taierzhuang Museum of the War of Anti-Japanese Resistance. The first two are in Beijing and under heavy scrutiny, while Taierzhuang is in the countryside of Shandong, far from the eyes of the central government. It appears that as distance increases from central government control, the memories enshrined in Chinese museums and monuments appears to shift towards more positive memories of the Guomindang, signifying a more diverse public memory of the war than the Communist Party perhaps wishes to recognize. The Second Sino-Japanese war, known as the War of Anti-Japanese Resistance (抗日战争) in China, has a complicated history. The National Museum claims it lasted fourteen years, beginning in 1931. During this year, Japanese forces guarding the Japanese owned railways in Manchuria faked an attacked on their own railway in the city of Mukden (Shenyang). This became known as the Manchurian incident, and resulted in the Japanese seizing most of North East China. For the next few years there was clashes with local resistance groups, and a few minor battles with Guomindang forces. The Communist Party of China, or CCP, declared war against Japan, and launched a guerilla campaign to fight Japan. The CCP leadership denounced Jiang Jieshi for not taking more direct actions against the Japanese. After a Guomindang General named Zhang Xueliang (张学良), often known in the West as the Young Marshall, kidnapped Jiang Jieshi and forced him to form a new United Front with the Communist Party against Japan. In 1937, the date more traditionally used by Western Historians for the beginning of the War, the Japanese attacked Beijing after the Marco Polo Bridge incident (Lugouqiao Incident). The Japanese were victorious, seizing Beijing, but the battle resulted in total war between the two nations. The first major Chinese victory was in 1938. After the fall of Shanghai and Nanjing, Li Zongren’s (李宗仁) army became trapped in Shandong province. In a bid to escape, he provoked Japanese generals Isogai Rensuke (磯谷 廉介) and Itagaki Seishiro (板垣 征四郎) into attacking him at Taierzhuang (台儿庄), once a major trading city under the Song dynasty due to its location on the Grand Canal, but now only a minor town. The Japanese fell for the feint, and the army was encircled and annihilated. Official Japanese statistics and the Taierzhuang war museum claims 7,000 Japanese soldiers lost their lives. Li Zongren then broke out of Shandong and regrouped with the rest of the Chinese army, and was a major force in defending the new capital of Chongqing against Japan for the next seven years of the war. In 1945, after fourteen years of conflict and war, Japan surrendered to the Allies, prompted by the Atomic Bombings of Hiroshima and Nagasaki, and the Soviet Invasion of Manchuria. The Communist Party tells a different story about the war. In what has been dubbed the “Yan’an Myth” by Diana Lary, the Communist Party claims that by forming a rebel base in Yan’an and coordinating rebel resistence movements throughout the occupied territory, they slowed down Japanese movements, drained resources and manpower, and slowly won the war. The reality is that this was a relatively minor aspect of the war, and Yan’an had little control over the underground cells throughout the country. The difference between the Communist narrative and the Guomindang’s narrative is what is being investigated in this paper. This paper will largely focus on the memory of the Guomindang generals in the war, with a particular focus on Li Zongren at Taierzhuang and the Guomindang leadership at Lugouqiao, and their depictions at the National Museum, the Lugouqiao Anti-Japanese War Museum, the Taierzhuang War Museum, and at the Taierzhuang Ancient City. Sun Zhongshan (孙中山Sun Yatsen) is discussed briefly, with a large portrait of him being quite prominent in the exhibit, but his connection to the modern Guomindang is carefully avoided. When Jiang Jieshi and the Guomindang are referenced by name for the first time, it is to denounce them for betraying Sun Zhongshan’s revolution. No other members of the GMD leadership are mentioned. Even Zhang Xueliang, who is featured quite prominently in other museums (especially those in Xi’an), is conspicuously absent from the exhibit’s narrative. The war with Japan was dealt with only briefly. The exhibit declares that the CCP was the “Tower of Strength” in the war and that after fourteen long years the Chinese were victorious. There was not mention of how it took place in the greater context of World War II, or The World Anti-Fascist War as it is referred to in other Chinese museums. This is amount of blatant propaganda is unsurprising. The National Museum is the most official museum in the country, literally situated across from the National People’s Congress and Mao Zedong’s mausoleum. The museums primary purpose is quite clearly not education. In the South West corner of Beijing is the Marco Polo Bridge, or Lugouqiao in Chinese. It was the site of the first major battle of the Second Sino-Japanese War in 1937. Today there is a massive war museum, which just reopened in July after a long renovation to prepare it for the 70th Anniversary of the end of the war. This museum unsurprisingly provides much more detail, and is much more fair towards the Guomindang compared to the National Museum. In particular, they museum went into great detail about Zhao Dengyu and Tong Linge, two Guomindang generals who died defending the city. The museum has their portraits hanging prominently and depicts them as true Chinese heroes. They are also the only Guomindang generals featured so prominently. Nearly every Communist general during the war has a portrait in the museum, but important Guomindang leaders such as Li Zongren and Bai Chongxi are not only never depicted but are never even mentioned. Even the more controversial Communist figures such as Lin Biao are depicted. Perhaps part of the reason why these communists have been rehabilitated while Li Zongren is not is the in-group out-group mentality (内外).Li Zongren may have eventually defected to the People’s Republic of China, but he was never a friend to the Communist Party or the peoples liberation army. There is a small area depicting the Battle of Taierzhuang, where a plaque mentions that it was one of China’s greatest victories. It does not mention why it was one of China’s greatest victories, or that it was Li Zongren who commanded the Chinese army in the battle. Zhao and Tong however had no connections to the Communist Party at all but are featured prominently. Perhaps the reason that Zhao Dengyu and Tong Linge are acknowledged and Li Zongren and Bai Chongxi are ignored is that Zhao and Tong died during the war, and never fought against the communists in the Civil War from 1946-1949. Li Zongren’s omission is still interesting, seeing that he defected to the People’s Republic in 1965 shortly before his death. Jiang Jieshi is mentioned only a few times, and when pictured it is almost always to highlight someone else he was standing with, such as the picture of him, Song Meiling, and General Stilwell (who actually commanded the Chinese army fighting in Burma, which is a fact that is never mentioned in the museum). The museum also declares Jiang to be incompetent and unwilling to fight in the museums introduction to the war. The museum highlights the Eighth Route Army （八路军) often, but never really acknowledges that the other armies were fighting for the nationalists. Whenever the Eight Route army is discussed its communist origins are proudly proclaimed, but when the museum discusses the Nationalist soldiers they are only ever referred to as being Chinese. The next two sites are located in Shandong Province, Zaozhuang Taierzhuang, site of China’s first great victory against Japan during the war. Shandong has long been known for its historical tourism industry, largely due to Mt. Tai (泰山) and the Confucius mansion in Qufu (曲阜). The Guomindang however never established much of a symbolic presence in Shandong throughout monuments and museums after the end of the war, despite their great victories there. However, there still seems to be lingering positive memories of the Guomindang in Shandong province, and especially within Taierzhuang. The War Museum in Taierzhuang told a significantly different story from the museums in Beijing. I assumed that due to Li Zongren’s crucial involvement in the Battle of Taierzhuang, the museums in Taierzhuang could not possibly avoid discussing the man. This was absolutely the case, and surprisingly positively identified many other Guomindang leaders. One of the more striking features of the museum was a massive picture of Jiang Jieshi with caption describing him personally visiting the front line. It acknowledged how Jiang would often visit the front lines of the battlefield and take command (which is something Jiang’s general’s hated). The museum was portraying him heroically and was making no attempt to diminish the important role he had in the war. A short while later they even had a picture of Li Zongren and Bai Chongxi together, who were always close friends and allies. Bai was also responsible for the massacre of communists in Shanghai, so his presence is surely controversial. The caption said his name, but did not give any further insight. Near the end the museum weakly defends the communist party, claiming that many soldiers who fought at Taierzhuang and were communists or would later join the communist party, and that guerillas also aided the Nationalists in the battle. It does not however try to take credit for the victory as a whole. It lets the Guomindang take the glory this one time. The final site, which has the least direct focus on the war, is the Taierzhunag Ancient City. Today primarily a tourist attraction due to its beautiful preservation of the grand canal, the legacy of the battle of Taierzhuang and the War of Resistance Against Japan is still felt here. For one, the number of Guomindang and Republican battle flags that were hung around the city was quite surprising. In a small alleyway, there was a large photograph of the Anicent City in ruins after the battle. The caption read “The Nationalists promise to rebuild Taierzhuang.” This really stood out. This was the first time I saw anything that referenced positive plans that the Nationalists party had for after the war. Other plaques in Taierzhuang often specifically say Nationalist soldiers instead of Chinese soldiers, something that is avoided in all of the other museums. There were also a number of Guomindang flags throughout the city, and almost no references to the Communist Party. 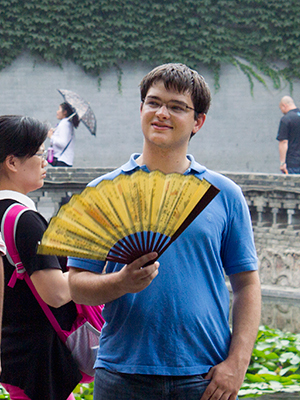 There are also Chinese language guided tours at the Taierzhuang Ancient City. At one point when discussing the battle, which I wrote noted in my field journal, the tour guide called Li Zongren “the hero of Taierzhuang.” Compared to the museums in Beijing ignoring his existence to being blatantly called the hero of Taierzhuang is a massive divide in the public history provided by the curators in Beijing and Shandong. The narrative of the War of Resistance Against Japan is not consistent from province to province. In Beijing itself, there is significant denial of the accomplishments of the Guomindang and the Communist Party seems to have doubled down on the Yan’an myth at the expense of the legacy of the millions of soldiers who fought for the Guomindang and their leaders. Museums in Beijing seem to either ignore the Guomindang’s great achievements such as at Taierzhuang and in the Burma campaign, or are only mentioned in passing. Nearly all focus is given to the exploits of the Eight Route Army. Further away from the central government in Beijing the narrative shifts to a more accurate memory of how the Guomindang resisted valiantly against the Japanese invasion. While in Beijing museums only acknowledge the contributions of the Guomindang generals who did not live to see the Civil War, in Shandong e­­­­ven the role of the much-despised Bai Chongxi is acknowledged. China is massive and diverse country with a wide range of experiences during the war, and despite its centralized government its public memory and historical institutions still provide diverse narratives about these formative and controversial years in Chinese history. While the memory of the Guomindang leadership in Beijing remembers only their failures, in Shandong the museums and monuments are also willing to recognize them in their finest hour. Hsi-Sheng Ch’I . Nationalist China at War: Military Defeats and Political Collapse, 1937-1945. Ann Arbor: University of Michigan Press, 1982. MacKinnon, Stephen R., Diana Lary, and Ezra F. Vogel. China At War: Regions of China, 1937-1945. Stanford, Calif.: Stanford University Press, 2007. Hsi-Sheng Ch’I . Nationalist China at War: Military Defeats and Political Collapse, 1937-1945. (Ann Arbor University of Michigan Press, 1982). James A Flath Managing Historical Capital in Shandong: Museum, Monument, and Memory in Provincial China.” The Public Historian, Vol. 24, No. 2 (Spring 2002), pp. 41-59. 46.